Last week I talked about Halloween being the beginning of the story season. This week, I’ll concentrate on another great Halloween tradition: romance. 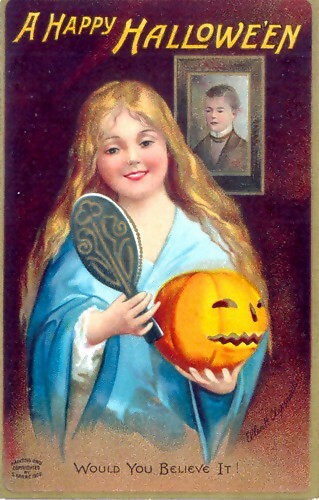 To our modern minds, Halloween is half cutesy kids’ stuff, and half horror and blood. But 150 years ago, people also thought Halloween was the best time to find your future mate. The boundaries between the everyday world and the world beyond blurred, and single men and women used all sorts of fortune-telling tricks with apples and mirrors. On a more practical level, Halloween parties brought young people together, and Halloween games gave them a chance to sneak off alone into the kale patch to seek their fortunes and canoodle in the dark. So it should come as no surprise that Halloween has inspired some sweet, some sad, and some scary love stories. There’s something about a shiver and a chill that adds a little extra frisson to a romance. Happy storytelling! What’s your favorite Halloween or supernatural romance? This entry was posted in Character, Inspiration and tagged creativity, ghost stories, Halloween, Halloween fortune-telling, inspiration, magic, McSweeney, recycling fairy tales, Romance, romantic ghost stories, story stakes, writing. Bookmark the permalink. My favorite scary story is really a movie, “Don’t Look Now,” with Donald Sutherland and Julie Christie. Creeped me out. Plus, Donald Sutherland and Julie Christie. What great recs, and new to me, too! I’ll have to see if I can find them. There are a lot of really great books out there that I will never, ever read again because they are so harrowing. The Lovely Bones was one . . . .
Ooh, I read that one. Terribly disturbing, but that’s what makes it memorable.